The better alternative in regard to health safety, appearance and long-term function are tooth-colored composite resin fillings. 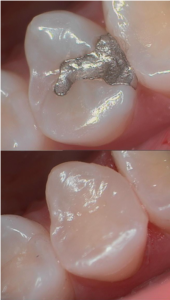 These fillings are actually made from a high-tech resin paste, which contains tiny glass beads. At Water’s Edge Dentistry we place fillings that are BPA Free. The composite fillings are a great alternative to metal fillings because they are the same color as your tooth and create a very natural appearance. They also provide superior strength, stability and longevity for the tooth when compared to metal fillings.